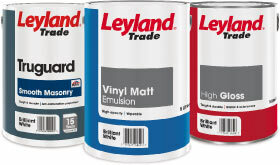 Leyland Paints are all manufactured in Birstall, West Yorkshire, UK. Leyland are owned by the American PPG Industries. Leyland Paint. Made in England. Crown Paints paints are all made in Darwen & Hull, England. Crown are now part of the Danish Hempel Group. Crown Matt Emulsion. Made in the UK. This entry was posted in Brushes, DIY Tools, DIY, Building Work, House of Hackney, Painting and Decorating and tagged 20th Century Cloth, Annabell Duke, Anthology, Anthony Hughes, Bartoline, BeeGee Brushes, British brushes, British made brushes, British made paint brushes, British made wallpaper, Briwax, Crown Paints, Decorating, DIY, Dulux Paints, Edmund Bell Ltd, Erica Wakerly, Fox Brushes, Frenchic Furniture Paint, Glow Paints, Glowtec, Graham and Brown, Harlequin, Harris Brushes, House of Hackney, Ian Mankin, John Lewis, KoverTek, Laura Ashley, Leyland Paints, Lining Paper, Lucas ProTools, Morris & Co., Mylands, Paint, Paint made in the UK, Painting and Decorating, Paper Boy Wallpaper, Piants, Rust-Oleum UK, Rustins, Sanderson, Sanderson Paint, Sanderson Paints, Scion, SELVYT, Sidney Paul and Co, Starglow, Tableau, Tesco, Tor Coatings Limited, Town Talk Polishing Co, UK made paint, UK made paint brushes, Wallpaper, White Spirit, Wilko, Zoffany on June 5, 2013 by ukmade.